By this measure, bungee jumping seems like a relatively safe adventure -- 50 times as safe -- especially if your idea of relaxation and low-risk enjoyment is paddling down a river somewhere. Now, of course, the incidence of death isn't the only measure of safety, or lack of it. What about non-fatal injuries? This is where it gets interesting, and fairly concerning. The list includes neck injuries, spinal injuries and gruesome injuries to the eyes, as described by Livestrong.com: NECK INJURIES " ... injury to it can range from mild to severe. 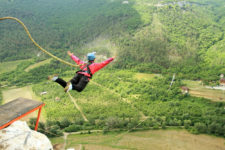 The force on this fragile part of your body that connects your brain to your spinal cord during the final stage of the jump can be enough to strain your neck muscles, and cause pain and a temporary decrease in range of motion. There have also been instances of the bungee cord accidentally entangling a jumper’s neck. When this happens, it can cut off blood flow between the heart and the brain, or strangle the jumper and make him unable to breathe." SPINAL INJURIES "The extreme forces your body is subject to as it is pulled back upward by the bungee cord can injure the vertebrae of your spine ... Injuries typically include compression fractures — broken bones in the spine — and herniated discs and spaces between the vertebrae. While these injuries can be healed, they can also be severe and permanent. If the spinal cord inside the vertebrae is damaged it can result in forms of paralysis and quadriplegia." EYE INJURIES These occur "because of the dangerously high increase in pressure that occurs in the eyes. When the elastic chord suddenly jerks you upward, it causes fluid to flow to your head, which results in very high blood pressure inside the blood vessels in your eyes. Your retina ... can be negatively affected by this increase in pressure. Injuries to these areas of your eyes usually cause temporary impairment of vision." And then there's ... 'HEAD DIPPING' And for those leapers who really look to tempt fate, some bungee jumpers known as "head dippers" take the plunge over water and actually aim to submerge their coconut below the surface before being yanked back up above it. (Why? Who knows.) But here's what happens when it goes wrong. "If the height or your weight is even slightly miscalculated, then hitting water at speed is not much different from tarmac. This is exactly what happened to one San Franciscan jumper, who smacked face-first into the water, and continued down until waist-deep," writes Lewis Dartnell from the Centre from Mathematics and Physics at University College, London, along with co-author Dr. Mike Clifford from the University of Nottingham, in a 2013 paper on physics of bungee jumping. "He claimed to have experienced little pain at the time, but woke the next morning with his mug so bruised and swollen he could not open either eye. A CT scan revealed hair-line fractures in both his nose bone and the floor of his eye socket." Millions, perhaps tens of millions, of jumps -- it's difficult to be sure -- have been performed since the activity was reportedly introduced in Bristol, Great Britain, in 1979. At the same time the number of injuries resulting from the sport is a figure that's just as elusive. 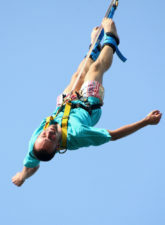 Combined, both unknowns make it anyone's guess as to determine whether bungee jumping is "safe" or "safe enough" -- and whether it's a risk worth taking. If you're unsure, maybe you should ask a friend what he thinks.